The prestigious publication Ethnic Groups and Boundaries Today: A Legacy of Fifty Years has come out from Routledge. 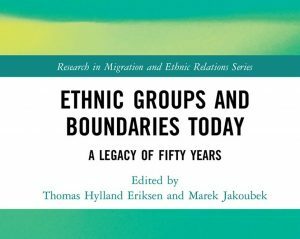 Marek Jakoubek and the socio-cultural anthropologist Thomas Hylland Eriksen prepared the book for the 50th anniversary of the publication of the famous volume Ethnic Groups and Boundaries. The Social Organization of Culture Difference (ed. Fredrik Barth), which came out in 1969. The book marked a milestone in the conceptualization of ethnicity and ethnic groups and opened a new field of enquiry in the social scientific study of ethnicity. To mark the anniversary Marek Jakoubek (Department of Ethnology, Charles University) and Thomas Hylland Eriksen (Department of Social Anthropology, University of Oslo) have edited a new book, Ethnic Groups and Boundaries Today: A Legacy of Fifty Years (Routledge 2019), where some of the major theorists and researchers in the field assess the significance of the Barthian perspective within the context of their own research. Ethnic Groups and Boundaries Today demonstrates the enduring significance of the work, identifying its shortcomings and showcasing the state of the art today, fifty years after the publication of the groundbreaking original. As such, it will appeal to scholars across the social sciences with interests in the concept and study of ethnicity.